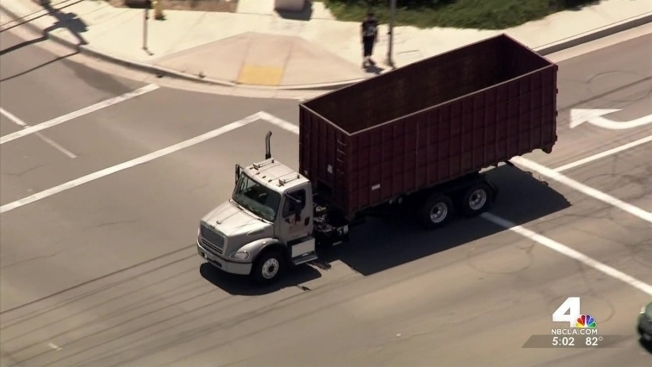 Officers pursued the driver of a stolen truck hauling a large container Tuesday afternoon on freeways in three Southern California counties after authorities received a report of an assault on a police officer. The pursuit began at about 1 p.m. in the Ontario area after authorities received a report that the driver attempted to run over an officer, according to the CHP. Nearly two hours later after a chase on the southbound 15 Freeway through Riverside and San Diego counties, the driver exited onto streets just north of San Diego, stopped at a fuel station and ran from the vehicle. 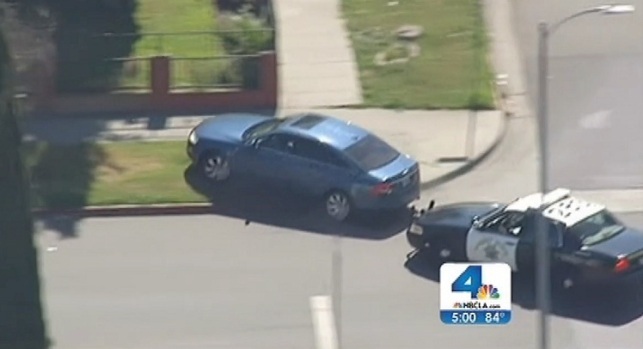 The driver was taken into custody at the gas station near Kearny Villa and Miramar roads. After the assault report in Ontario, the pursuit continued south on the 15 Freeway before the driver exited the freeway onto streets in Lake Elsinore. The truck was estimated to be traveling at about 80 mph as drivers pulled over to allow the driver and officers to pass. The driver traveled against traffic on streets before re-entering the freeway heading south through the Wildomar area. The driver exited the freeway again south of Temecula and drove through a fuel station parking lot and back onto streets. The pursuit continued southbound on the 15 Freeway in San Diego County. The large red bin -- possibly a shipping container -- appeared to rise off the rig during the chase before easing back onto the vehicle.